Alright, I know all of us have our Sour Days and our Happy Days. One more than the other. Alright, we all know the Scene in the Incredibles where Frozone is yelling at his Wife about his Supersuit. I was watching this scene and I love seeing the top comments, and one of the top comments dealt with President Obama and Michelle Obama. 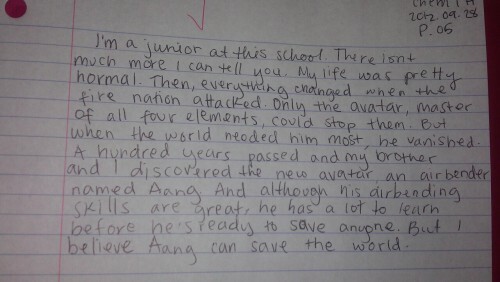 Someone turned in a paper to their Chemistry teacher about thier life and got an A for it. GAIS GAIS LOOK. I know this isn't Laugh of the Day but I didn't want to make a New Topic. And when this is going to happen?